Antic pub tucked down a narrow alley just off Catford Broadway in Catford. 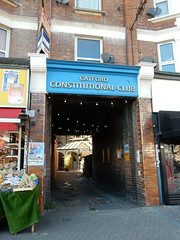 This is the old premises of the Catford Conservative Club, vacant for two decades before being reopened as a pub in 2013. The main room is cavernous and dimly lit, even in broad daylight. Candles on the tables flicker in the gloom, and bunting hangs overhead. Half of the space is allocated as a restaurant area, with a sign warning that diners must wait to be seated here. Back across the hallway near the entrance is a smaller room which the sunlight is actually allowed into. This has something of the feel of an old-fashioned living room, with vintage portraits hanging above glass-fronted cabinets and a sideboard in one corner with a tall bar stool rather absurdly drawn up in front of it photo. Two low armchairs sit in the curve of a bay window which looks out directly onto the junction of a brick-built and a breezeblock wall. Flock wallpaper lines the walls, peeling artistically in places. Kake and bob visited on a Thursday early evening in September 2015. There were about eight or nine other customers in when we arrived a little before 5:30pm. Music was playing, not too loud. There were five real ales and one real cider available: Firebrand Ask For More 34, Weird Beard Mariana Trench, Dark Star Partridge, Volden Vim (brewed by Antic's own brewery), Deuchars IPA, and Celtic Marches Ruby Tuesday cider. A pint of lime and soda was free. According to their website as of September 2015, food is served 5pm-10pm Tue-Fri, noon-5pm and 6pm-10pm Sat, and noon-5pm Sun. It includes bar snacks such as sausage rolls, scotch eggs, and hummus with pita. The restaurant menu photo as of Sep 2015 differs slightly from the bar menu photo as of Sep 2015. Deep-fried salt & pepper squid with roasted garlic mayo (£6) photo was disappointing; the squid was chewy and the batter was floury. Pleasingly, there was a vegan dish on the menu — chargrilled summer vegetables with giant couscous, roast tomatoes, and basil oil (£8.50) photo. This was quite tasty, though some of the aubergines were undercooked and chewy. Overall it was a good dish, though rather lacking in protein. We also tried the beefburger and chips (£10.50) photo. This normally comes with cheese but they were happy to leave it off. The burger was obviously hand-made, given the texture and irregular edges, and it was grilled well, done to medium-rare by default. The chips were skin-on, pre-salted, and pretty good. According to their website as of August 2015, there's a pub quiz every Tuesday from 8pm. Child-friendliness: According to their website as of September 2015, children are "most welcome throughout the venue". There's a pull-down nappy-changing table in the accessible toilet on the ground floor. Dog-friendliness: According to their website as of September 2015, they are dog friendly. Accessibility: A step to get in. Once you're in, there's an accessible toilet on the ground floor, with grab bars, low sink and hand drier, and alarm cord. Other toilets are up a curving flight of stairs with a handrail on the side. Last visited by Kake, September 2015. Opening hours taken from the Catford Constitutional Club website, August 2015. Last edited 2017-09-15 17:23:22 (version 4; diff). List all versions. Page last edited 2017-09-15 17:23:22 (version 4).